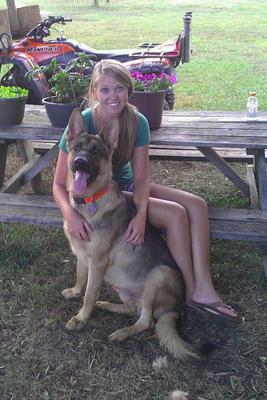 Attached is a picture of me, Joanna Boone, and my 1 and ½ year old German Shepherd, Zoubek. I adopted Zoubek when he was 3 months old, but I had his name picked out for over a year. He is named after 7’1” Brian Zoubek, a Duke University basketball player. I thought the name was just so fitting for a GSD…I don’t know why. Zoubek is my first dog. I grew up with dogs as family pets, but Zou is MINE, and I could not love him more than I do. I never knew I wanted a dog for protection until June 22, 2009. That night I was visiting my grandmother and my cousin at her home in small town, North Carolina. Suddenly, there was a loud noise and there were 3 huge men brandishing guns in our living room. Needless to say, it was the scariest moment of mine, my cousin’s and my grandmother’s life. My grandmother quickly pressed her lifeline button and a man’s voice came over the speaker which scared the men and they left, but not before chasing me and my cousin and threatening us with a loaded gun. Again, one never truly knows how scary a situation like this until she experiences it. GSDs. I moved in with friends for fear of being alone because I constantly relived the events of that frightening night. On May 5, 2011 I was searching the internet for GSD puppies (like I did almost every day), and I found a picture of the puppy I HAD to have. My parents were furious because they insisted I was not ready for a dog, but I mean it, I HAD TO HAVE THIS puppy. This one, and no other would do. On May 6 I went to “look” at the puppy (yeah, right…I went to adopt that puppy). Obviously, he came home with me. Adopting that dog was the best “bad” decision I have ever made. (By the way, my parents now adore him and call him their grandson.) Soon after adopting him, Zoubek and I moved into an apartment (one that allowed large breeds) and I am so proud to say that he gave me the courage and confidence to live by myself again. He is my best friend, my protector, my main man, and the most amazing dog in the world. Zoubek has grown into such a handsome dog. He weighs 92 lbs and is still growing. He loves to play ball and, most of all he loves his mama. This is less about us entering a contest, and more about sharing our story. Zoubek is absolutely the best thing to ever happen to me. What a Handsome male Zoubek is, big ears, big nose, big feet = GERMAN SHEPHERD!!! Shepherds are amazing, they are soooo Protective rather they are male or female, it really doesn't matter they will Protect, it is in their blood. Take care of your boy and he will take care of you!